Amritsar Prison presently accommodates around 100 female inmates. Hostel No. 1 of the Prison has been earmarked for this purpose. The Amritsar Jail in association with various Government and Non-Government Organisations launched a number of projects for empowerment of women prisoners. 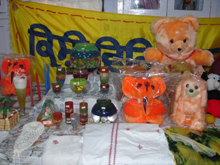 Under the scheme, the female inmates are being taught how to weave, make toys, stitch and make embroidery items. Female inmates are also taking keen interest in the education and health advocacy programmes. A separate kitchen has been recently started for the female inmates with a view to improve the quality of food. Dress designing: Certificate Course in Dress Designing has been started by the Department of Adult Continuing Education and Extension of Guru Nanak Dev University, Amritsar. The University has appointed a full time instructor for this purpose. Vocational Training by KVK: The Home Science wing of the local Krishi Vigyan Kendra in collaboration with India Vision Foundation has started vocational training in candle making, food preservation, toy making, tie and dye, fabric painting, pot painting, home craft. 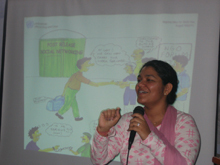 KVK is a joint venture of ICAR (Indian Council of Agricultural Research) and Punjab Agricultural University. 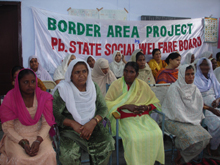 Boarder Area Project: Under this project, Punjab Social Welfare Board in collaboration with India Vision Foundation has started various programmes to support women inmates in a number of life skill programmes like Embroidery and Knitting, Family counseling and Primary Education. The children residing with their relatives in Amritsar jail can now be able to compete with their social counterparts outside. All the Children who are in the age group of 3-6 years have been admitted in the Government Primary School. The children upto six years of age are allowed to reside in the jail along with their kith and kin. It is the moral responsibility of the prison authorities to provide them all support so that they are able to receive proper education and to compete with the other children of their age group in the society. This is for the first time in Punjab that children residing in jail are attending classes outside the premises of jail. 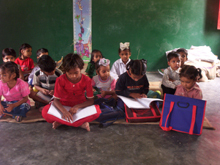 India Vision Foundation is providing reading material and other support to these children. A crèche for the wards of the women prisoners has also been set up by Punjab Social Welfare Board with the help of the India Vision foundation. Project H-71: United Nations Office on Drugs and Crime (UNODC) has launched this project in Amritsar Prison in collaboration with India Vision Foundation to prevent drug driven HIV. It is a peer led intervention which aims to intensify efforts to reduce drug related HIV/AIDS amongst vulnerable high-risk groups including prisoners. Similar programme has been started for the Male Prisoners also. Punjab Red Cross Society has also initiated various programmes with a view to educate the prisoners about the ill-effects of Drugs and HIV and to bring awareness about effective preventive measures.